Aerospace engineering Ph.D. student Elaine Petro was recently named the 2018 Alex Brown Leadership Award recipient. Petro, a student in the Space Power and Propulsion Laboratory, was selected by a faculty panel based on her academic scholarship and research accomplishments, as well as her outstanding contributions to service and leadership in the Department of Aerospace Engineering. The Alexander Brown Scholarship and Award consists of a $1000 scholarship and a commemorative medal. Established in 2011, this award honors the memory and achievements of the late Alex Brown, who was a Ph.D. candidate in the Aerospace Engineering program. Well known for his energy and great leadership skills, he inspired and encouraged others to excel in education and research, as well as leadership and service. Elaine Petro has excelled in all aspects of academics, research and scholarship, and has published two journal articles and several conference papers in her field of space propulsion using a helicon thruster. In her first year as a graduate student, Elaine served as a teaching assistant for two undergraduate courses. 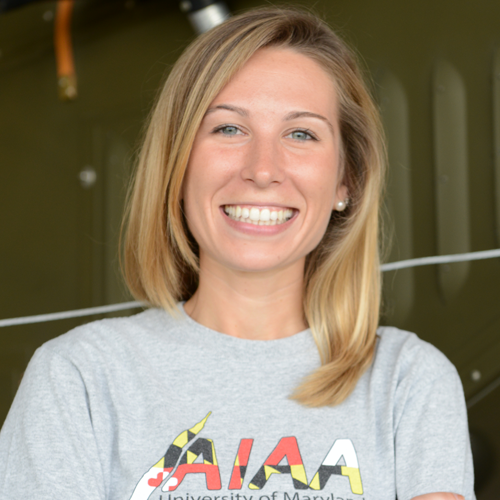 For her efforts, she was awarded the Best Teaching Assistant by the Department of Aerospace Engineering in 2013 and was selected as the Best Teaching Assistant by the UMD AIAA Student Chapter for 2013-2014. She was the recipient of a National Science Foundation Graduate Fellowship and an Amelia Earhart Fellowship. Elaine also received the national distinction of being one of Aviation Week and Space Technology’s “20 Twenties,” an annually selected group of up-and-coming engineering leaders in their twenties. Elaine is very active in service to the aerospace community at the University of Maryland. She is a member of the Aerospace Graduate Student Advisory Committee (GSAC), which holds social events for the graduate student body, as well as serves as the voice of the graduate students within the department. She is also a founding member (2015) of WIAA, the Women in Aeronautics and Astronautics who have organized several student/faculty happy hours, exam study day pancake breakfasts, back-to-school ice cream socials and a student/faculty Halloween party and costume contest. She invited (and organized the visit of) the Astronaut and former AIAA Executive Director, Dr. Sandy Magnus, who met with WIAA members and then gave a lecture that was open to the whole school of engineering. This meeting then led to Dr. Magnus being invited to give the commencement address at the 2016 Clark School winter commencement. Elaine helped to organize the first ever “WIAA Day” in April 2016 where they brought 75 high school students to campus to learn about aerospace engineering. This event has turned into an annual event. Elaine was personally responsible for coordinating and managing lab tours for the parents and students during the visit. She was also instrumental in the organization of the first ever “WIAA Night” last November. In this event, about 100 students, plus faculty and 30 industry partners spent an evening networking: her role has been to spread the word about WIAA and to build industry partnerships.